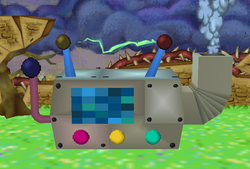 The Puff-Puff Machine is a device that creates clouds and appears in the game Paper Mario. It is used by Huff N. Puff and his followers to cover Flower Fields in clouds and put the Sun out of commission. Mario and his sidekicks destroy it after defeating the 3 Lakitus and a Yellow Magikoopa maintaining it. The Puff-Puff Machine's destruction allows Mario and his allies to gain entry to Cloudy Climb, the lair of the vile Huff N. Puff. The Puff-Puff Machine is at the end of the top right path in Flower Fields. It can be destroyed with a few whacks from the Hammer or Bombette's Bomb attack on each side. Before Mario destroys the machine, he can talk to the enemies. However, one random Lakitu will trigger the fight, if talked to. This page was last edited on February 17, 2018, at 10:26.